As of late I've been looking into getting Tyler Lee a booster seat for the kitchen table, he seems to have outgrown his Stokke Steps highchair and likes to sit at the kitchen table for meals now, but of course, he's too short to sit comfortably at it yet, so I thought a booster seat would be the perfect solution. 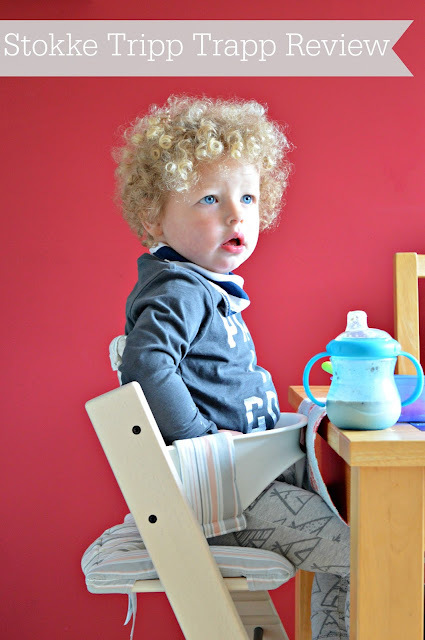 However, when I got the chance to review the Stokke Tripp Trapp Chair* (€182) and realised that it would fit nicely in by our kitchen table, as well as being a portable chair for Tyler Lee, I jumped at the chance to review. The Tripp Trapp was so easy to put together too, Jacek had it up in about ten minutes and then we were able to add all of our accessories. We also received the Baby Set* (€50), ideal as Tyler Lee is now a very active toddler and would just runaway from table if he wasn't in a proper baby seat. The Baby Set is made of sturdy, durable plastic and has a high back for keeping baby upright as well as an integrated crotch strap for keeping them sitting comfortably and securely. Tyler Lee is now two as is still very comfortable within this Baby Set so it really is something which will last your child for many years. We were also sent the Tripp Trapp Cushion* in Soft Stripe (€40) - an ideal choice as it looks lovely with the whitewashed Tripp Trapp chair. The cushion is so soft and keeps our son comfortable in his chair, instead of having his bottom on the wood itself. It just slides over the wood and attaches in parts with velcro so it's very easy to take off and put back on for cleaning. What I love about the Stokke Tripp Trapp Chair is just how much it has improved our family meal times. I love that we now are all able to eat together at the kitchen table. I love how stylish and sturdy the chair is, meaning that it will also be perfect for our future babies too. I love that different accessories are available for the Tripp Trapp Chair depending on the age of your child and their needs. Stokke have really covered all areas with the Tripp Trapp Chair and have come up with a quality product that is perfect for not only little ones but for their parents too. Anything that makes meal times with my picky toddler all the more easier is a winner in my book and the Stokke Tripp Trapp has really made Tyler Lee enjoy his meal times again instead of feeling 'trapped' in his highchair. I would highly recommend the Stokke Tripp Trapp Chair to anyone who is expecting or to anyone who simply wants to upgrade their child's highchair. The Tripp Trapp Chair really does offer the perfect mix of functionality and style which I'm sure every parents craves when it comes to baby products which are going to become a prominent feature in their home for the foreseeable future. You can browse the Tripp Trapp Chair range and see the other wonderful products Stokke have to offer on the Stokke website. *We were sent the Stokke Tripp Trapp Chair, Baby Set and Tripp Trapp Cushion for review. As always, all thoughts and opinions expressed in this post are 100% my own. This is such a stylish chair - love it! Hi! I'm planning on ordering the Tripp Trapp for my 2 year old daughter, but I'm not sure whether or not I should also purchase the babyset, as she really isn't a baby. How old was your son when he grew out of the baby set? Hi Sarah, my son is 3 and half and still fits into the baby set - (it makes sure that he eats his meals at least!) so I'd definitely recommend purchasing it too.